Sara Laginder (left) and Sara Hurtig are project managers of a pilot project aimed at cutting air travel. Uppsala University is launching a pilot project to reduce climate impact. Next year, 50 grants will be awarded to Erasmus students who choose to take the train instead of flying to their European host universities. Travel is a challenge in Uppsala University’s efforts to reduce climate impact. International contacts are essential to one of the top 100 universities in the world and for many people in the academic world, travel is commonplace. International experience is plus on students’ CVs and there are several exchange programmes with higher education institutions in other countries. “We would be delighted if even more students participated in exchanges to gain international experience, but we have to think innovatively to avoid increasing environmental impact. 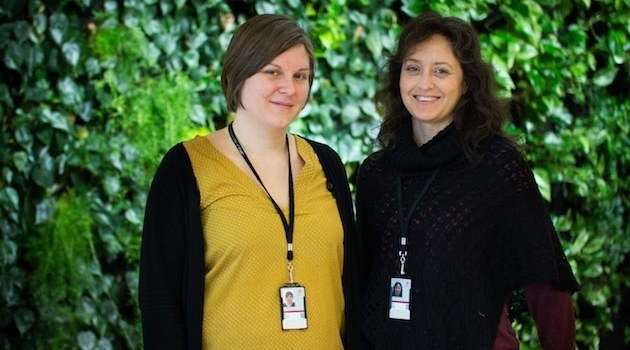 We have received positive signals from the students, many of whom are deeply committed to the climate issue,” says Sara Hurtig at the Student Affairs and Academic Registry Division, who is managing the project with her colleague at the Division, Sara Laginder. The programme is open to Erasmus students and applies to studies at any of the University’s European partner universities in 2019. The grants are a fixed amount, SEK 2,000, that covers most of the cost of a five-day railcard. Students apply when they apply for a scholarship and then are allotted randomly among the applicants. “As far as we know, there is no other initiative like it and several of our colleagues at European universities have shown keen interest. We hope that our initiative will inspire other universities to carry out similar programmes to create a huge overall impact.” The pilot programme will now show us how we should continue the effort and whether it is possible to involve more target groups,” says Laginder.